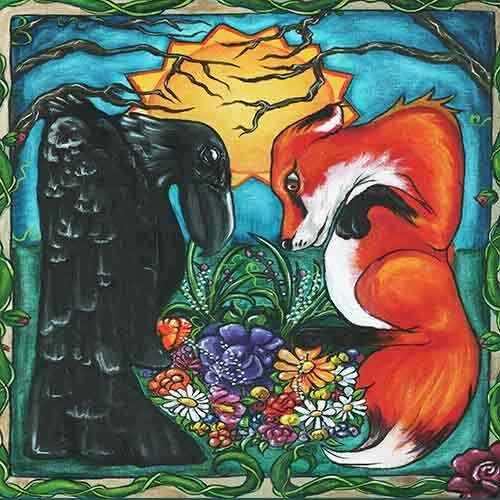 Alberta folk duo The Raven & The Fox offer a sound with a sly, mystical edge—what they’ve described from the beginning as “love-inspired mountain music". Julie Chang’s smooth, sultry vocals over Sean Isaac’s moody acoustic riffs offer eargasmic melodies paired with passion-soaked lyrics. On November 18th, join Julie and Sean for an intimate performance in the heart of the mountain. Chang and Isaac first connected during an informal jam session in Canmore when Julie was there from Toronto visiting her sister. She sang some songs and Isaac was instantly smitten. The first song they realized they could perform well together was Ray Lamontagne’s “Jolene,” and the evolution of The Raven & The Fox got underway from there. They maintained a long distance relationship while Chang completed her herbal medicine diploma in Toronto, a period that Isaac used to work on songs, sending lyrics to Chang in lieu of love letters. After being reunited in 2014, they began writing together and playing their first live shows in Alberta. Now with the release of The Raven & The Fox, the duo is poised to make an indelible first impression on the national music scene. The combination of Chang’s rich, dark-hued voice and songs as awe-inspiring as a Rocky Mountain sunrise makes this album a true gem, and the first of what promises to be many adventures for The Raven & The Fox. As the duo gets set for their debut in-cave performance, we caught up with Julie — singer and leading lady — to chat about performing below the earth, the highlights of their album tour, and the connection she and Sean share as partners both in music, and in life. Congratulations to you and Sean on your fantastic new self-titled album! Are there some memorable moments you’ve experienced during your album release tour that you can share? We had a lot of fun playing a loud, large, high-ceiling pub in Squamish, which turned into a Saturday night singalong in an unusual way. We’re not so much of a big-night-out, pump-up, dancey band, and our music is not usually so conducive in huge spaces. But this gig really took off, and by the end, everyone in the whole place was singing along with us to Sweet Child O’ Mine by Guns N’ Roses, which we usually play to finish our sets. That was a pretty cool moment, to connect in a space where our music doesn’t usually get through. On the flip side, we also played at a café in Kamloops, which was our smallest audience ever. It was really nice and intimate. Playing at venues of varying sizes, stimulus, and sound quality makes you a better musician because you learn how to adapt. We hear that there is a great story behind how you and Sean met – how The Raven & The Fox was born! Can you tell us more? I was born and raised near Toronto, and I was living back there in 2014 when I came to visit my sister in Canmore. We went out for wing night at The Wood and Sean was there with another group. Their circles of friends knew each other, we got chatting, and I was intrigued by him straight away. We connected through our mutual passion for music, and we ended up practising, singing and playing Jolene by Ray Lamontagne together on that first night that we met. Ever since Sean and I connected, I’ve been living on and off here in Canmore, and settled here in 2015. It was music that made me really want to live here, too. Back in Toronto the city is so spread out, so it was hard to connect with people and play music. It was totally different when I came to Canmore, and now playing music is how I spend nearly all of my time here! We read on theravenandthefox.com that many of your songs started out as love letters, written by Sean when you were living apart. With lyrics like “follow me across the ocean, across the prairies…”, is Follow Me an example of one of these songs that’s truly from the heart? It is! After we met and I was still living back in Toronto, Sean would send me old-school love letters, snail-mail style from Canmore. Mountain Moments was the first one to become a song. It’s catchy and upbeat, so a lot of people have liked that one. People have also been connecting with Everything, a song I wrote about Sean for his birthday a few years ago, which is quite mellow. Sweet Dreams is another love-note-inspired tune which has been really well received from the new album. It’s our most popular track on SoundCloud. Having a partner who’s both a romantic partner, a business partner and a performing partner—what’s it like? How do you complement one another? A lot of people enjoy our connection! Both of us come from super casual, untrained backgrounds. I never thought of myself as a songwriter until I met him. I just watched his process as a writer and he inspired me. I love his style and we just came together. Sean is the kind of person who makes things happen. He has made a career out of climbing, which is hard. It’s kind of a surreal working relationship for us. We get along so well. We’re so happy and humbled to do this together. Creating, travelling, doing what we love. Can you tell us about the role that music has played in your life? How did it influence you as you were growing up? I’ve only taken one formal vocal lesson in my life. While growing up, I was singing all the time with my sister and my dad. We would drive around in our motorhome listening to and singing so much music. Both of my parents can sing in key, and they exposed me to so much music, so it was in the family. My dad is a very good self-taught singer and he’s very funny. He has a powerful, amazing voice and he loves to sing karaoke. Whenever I go back home to Ontario, we’ll stream karaoke songs on YouTube and sing them together. It’s a highlight every time. Especially at Christmas, it’s a ritual. Dad gets pretty into it—sometimes he gets up off the chair, he’s in the air, he’s gesturing! He’s a hilarious man. Sometimes he’ll start singing Italian opera too. My mom loves it, and she can totally sing too, but she is timid and would never tell you. So she hums along, laughs and films our karaoke sessions. Mom was born in Italy, and dad in Shanghai, so my sister and I are first-generation Chinese-Italian-Canadians. We’ve been exposed to a pretty cool musical fusion. For The Raven & The Fox, I sing, Sean mainly focuses on the guitar, and we have both written songs. Sean he has two sons (aged 11 and 14), and they’re the most amazing musicians I have ever seen. They both play a number of instruments, and both have perfect pitch so they are great singers. The older one hosts open mic events, writes his own songs, busks at the markets and has opened for us a couple of times. Can you tell us more about the role that music plays in your life outside the band? I graduated from my Royal Conservatory exam in Grade 8, then didn’t touch a piano for 15 years. So I never thought I would come back to it. But now I am, in full force, and as a music teacher! It fell into my lap when I took over the business from a friend who left town. Now I have 25 students, the kids I teach are so amazing and I love it so much. I teach lessons right here in my living room – mainly piano lessons, plus a couple of singing students and one ukulele student. For Sean and I, our living room is basically a massive jam space. We have a full drum kit, a mandolin, many guitars, an organ from the thrift store, a bunch of amps, and of course a piano. It must be an incredible feeling to take such personally meaningful songs, and to have them resonate with a receptive audience. What fuels your passion as a musician? Singing is so special. It’s the ultimate tool of expression and it’s coming from your own body. To literally attune and feel your own ribs vibrating, the sound coming up through your lungs… it’s truly the coolest thing. Your voice is such a powerful yet delicate instrument, so you have to take care of it. I love the way it feels when it’s moving through me and how I can convey emotions through it. I think everyone should join in and sing, even if you don’t think you’re very good. It feels great, it’s good for you, and it’s a wonderful outlet. What’s on your mind in the lead-up to your unEarthed Music gig in Rat’s Nest Cave? It’s not your average music venue! The whole thing is so awesome and surreal, and it will definitely be our most unique gig so far. We can’t wait to hear how our music will sound down there. Since you obviously can’t plug in any equipment, my voice and Sean’s guitar will be totally acoustic. We’re going to have to equalise ourselves to get our levels right, as opposed to doing that through a PA or amp. It will be so cool to hear my voice echoing off the walls and hear the raw sounds of Sean’s beautiful, old Martin guitar and the natural acoustics. Exploring Rat’s Nest Cave has been on Sean’s radar for a long time. It’s so awesome that this is so close to our own back yard here in Canmore. The only place we’ve performed that’s even remotely comparable was on the bluffs at Mt. Yamnuska, when we were shooting our music video. But this is going to be something else entirely. We are blown away by the whole concept. We know that Sean is a ACMG Alpine Guide and a professional climber – have his outdoor adventures led either of you to go caving before? Sean and I have been caving together once, at Keyhole Canyon in Zion National Park in Utah. It blew us both away. Then I started to hear about Rat’s Nest Cave with Canmore Cave Tours. I asked Sean if he had explored it, because it seemed right up his alley as a climber. Surprisingly, he’s lived in Canmore for 26 years yet he’d never done it, but he had wanted to for a very long time. Then we saw a video of Elk Run & Riot performing at another unearthed Music event last year and thought it was the coolest thing ever. It’s been a long time coming and we can’t wait to check out Rat’s Nest Cave ourselves for this gig. What’s next for The Raven & The Fox? After our unEarthed gig inside the cave, we’ll be wrapping up our album release tour in early December. Then in February we’re heading with Kitty, our friend and cellist, to Kansas City for the Folk Alliance. It’s a big workshop weekend dedicated to folk music with a bunch of bands, festival scouts, record labels and lots of talent coming together. Sean and I also want to get back into writing new music. We love the creative process and we can’t wait to dedicate more time to it! Only 24 lucky cavers will get to experience this one-off performance. Will you be one of them? Find out more and reserve your spot today — limited tickets remaining! This once-in-a-lifetime experience combines an evening Explorer Tour with a unique performance in the Grand Gallery - the largest room in the cave. This is a rare opportunity to get up close and personal with the performers in a spectaclar but intimate setting. When you reach the Grand Gallery this cathedral-sized room will be transformed into one of the most spectacular performance venues imaginable. Just you and twenty-three soon to be great friends. Not one to be missed.